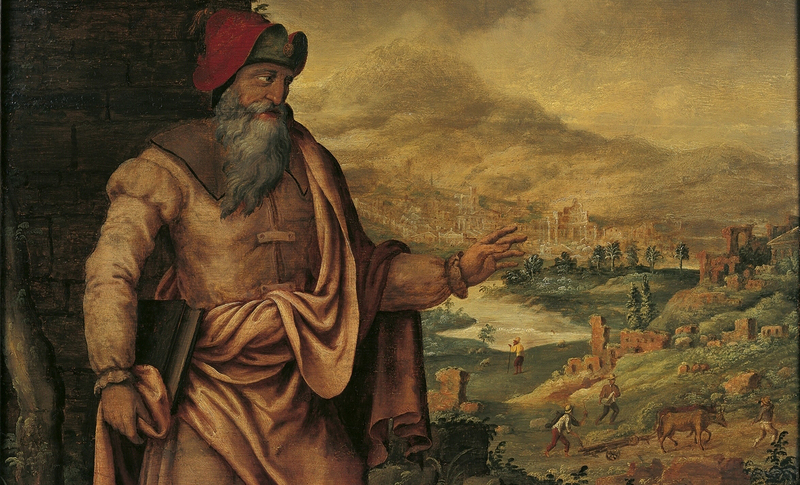 Maarten van Heemskerck’s “The Prophet Isaiah Predicts the Return of Jews After Exile.” Image Via WikiCommons. After his extensive quotation of Isaiah 2–14 (2 Nephi 12–24), Nephi not only interpreted these chapters (2 Nephi 25-30), but he also provided five keys to help his readers to better understand and delight in the words of the Judean prophet. Nephi was aware that “Isaiah spake many things which were hard for many of [his] people to understand,” but mainly because they did not understand “the manner of prophesying among the Jews” (2 Nephi 25:1). He wished that every person could be blessed with the spirit of prophecy. This list involves both intellectual as well as spiritual factors. For example, Parry explained that understanding the manner of prophesying among the Jews (v. 1) includes understanding how the ancient authors of the Old Testament employed such tools as symbolism, metaphor, poetic devices, and prophetic speech patterns (key 1).2 Understanding Isaiah and other ancient prophets in this way requires serious mental exercise, including a close and perceptive reading of the text and, whenever possible, being aware of the original language as well as the historical and literary contexts of its composition. Likewise, becoming familiar with the geography of ancient Israel (key 4) is primarily a studious pursuit. While those with the gift of seership may at times glimpse distant (in time and location) lands, most readers of the Bible will obtain a knowledge of the “regions round about” Jerusalem by reading commentaries, consulting atlases, or visiting the Holy Land. At the same time, Nephi included spiritual preparation as the central key (key 3) to understanding Isaiah’s prophecies. He encourages readers to seek the gift of the spirit of prophecy, which “same spirit of prophecy provided or prompted the words of revelation to Isaiah.”3 To embrace this spiritual gift, readers must live worthy of the companionship of the Spirit of God and must shun the evil works of darkness and all unholy and impure practices (key 2). While intellectual endeavor might help some come closer to the spirit, ultimately the spirit of prophecy comes to those who exercise faith in Jesus Christ. “Individuals who possess the spirit of prophecy, or the testimony of Jesus, are, in a sense, prophets . . . in terms of possessing a personal, revealed testimony of Jesus Christ.”4 For Nephi, then, it’s not nearly enough to just comprehend the basic grammar or vocabulary of Isaiah. One must be attuned to God’s spirit, so “that they may know the judgments of God” and the other spiritual messages “according to the word which [Isaiah] hath spoken” (v. 3). Finally, reading Isaiah with an eye toward identifying fulfillments of his prophecies is also a key to understanding what Isaiah was talking about (key 5). Nephi concluded by mentioning that it helps to live in the days when prophecies are fulfilled. As the disciples of Jesus walked and talked with the resurrected Lord on the road to Emmaus, their eyes were opened because they could see how the words of Isaiah and the ancient prophets had come to pass (Luke 24:32). In a similar way, if our eyes are open to the world around us, we too might see how Isaiah's prophecies apply to our own lives. Nephi knew from his own life that we must worship and serve God with all our heart, soul, and might (Deuteronomy 6:5). Thus, he knew that understanding “the full spirit and meaning of the written word of God” would require all of our faculties, both intellectual and faithful, working together. One of the Prophet Joseph Smith’s revelations admonished the Saints to “seek learning, even by study and also by faith” (D&C 88:118; cf. vv. 78–80). Nephi taught his people these five keys because he knew that they really worked. He knew the manner in which his father Lehi and many prophets of the Lord spoke. He had seen how the hardheartedness and “works of darkness” of many in Jerusalem had prevented them from understanding and believing the prophecies of the band of prophets at that time. He sorrowed that his own brothers would not repent, forsake their unrighteousness, and come to understand. He himself had experienced the spirit of prophecy, had grown up in the regions around Jerusalem, and had lived to see many of Isaiah’s prophecies fulfilled as they applied to his own life and to the times of his own people. Of course, it helps to live in the time when these prophecies are fulfilled, but even at that, many people live at such times and do not look for, notice, or appreciate the words of the Lord’s prophets. This process of gaining understanding works for the writings of Isaiah as much as any other ancient or modern prophet. All who utilize these keys effectively can, as Nephi and Brigham Young invited, delight in the plainness delight of the words of Isaiah (2 Nephi 25:4–5). The great seer’s words, instead of being a confusing stumbling block, can subsequently instill deep and lasting faith in the Holy One of Israel. Donald W. Parry, “Nephi’s Keys to Understanding Isaiah (2 Nephi 25:1–8),” in Isaiah in the Book of Mormon, ed. Donald W. Parry and John W. Welch (Provo, UT: FARMS, 1998), 47–65. Avraham Gileadi, "Isaiah–––Key to the Book of Mormon," in Rediscovering the Book of Mormon, ed. John L. Sorenson and Melvin J. Thorne (Provo, UT: FARMS, 1991), 197–206. 1. Donald W. Parry, “Nephi’s Keys to Understanding Isaiah (2 Nephi 25:1–8),” in Isaiah in the Book of Mormon, ed. Donald W. Parry and John W. Welch (Provo, UT: FARMS, 1998), 47. 2. Parry, “Nephi’s Keys to Understanding Isaiah (2 Nephi 25:1–8),” 48–55. 3. Parry, “Nephi’s Keys to Understanding Isaiah (2 Nephi 25:1–8),” 56. 4. Parry, “Nephi’s Keys to Understanding Isaiah (2 Nephi 25:1–8),” 57. 5. Brigham Young, “Progress in Knowledge, &c.,” in Journal of Discourses, 7:33.